Tim White is the Co-ordinator of Classical Music at the Western Australian Academy of Performing Arts. He is a Senior Lecturer in Music, leads WAAPA’s percussion programme, co-ordinates all of WAAPA’s classical ensembles, supervises postgraduate students, and directs the award-winning ‘Defying Gravity’ percussion ensemble. 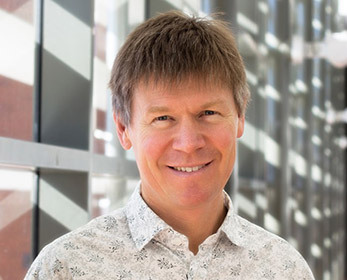 Tim White is the Co-ordinator of Classical Music at WAAPA, where he has led the percussion programme since 1994, co-ordinates all of WAAPA’s classical ensembles, and directs the award-winning ‘Defying Gravity’ percussion ensemble. Tim has played more than 3,000 concerts with the West Australian Symphony Orchestra - where he was Principal Percussionist for 28 years – and has performed with all ten of Australia’s professional symphony and theatre orchestras. He’s also been Principal Percussionist of the Tasmanian Symphony Orchestra, and spent a year guesting with the Melbourne Symphony Orchestra. As a concerto soloist, Tim performed the Australian and German premieres of Per Norgard’s ‘Percussion Concerto’ as well as the WA premieres of percussion concertos by Richard Mills, Paul Creston and Darius Milhaud. He’s also performed as a soloist for the Perth International Arts Festival. Tim was born in Canberra and grew up on Christmas Island. As a teenager he fell in love with The Beatles, got hooked on classical music and took up percussion, studying in Sydney, Denmark, Germany and the USA. He holds two Masters degrees in music performance, won a Churchill Fellowship in 1999, directed the ‘Rhythms of Life’ percussion festival for the Australian National Academy of Music in 2003, and was Musical Director of the Australian Youth Orchestra’s 2010 National Music Camp. In 2014 Tim won ECU’s ‘Vice- Chancellor’s Award for Excellence in Teaching’, and in 2015 the federal Education Minister presented him with the ‘Australian Award for Teaching Excellence’. Tim has performed with Ray Charles, Luciano Pavarotti, Placido Domingo, Jose Carreras, Dame Joan Sutherland, Dame Kiri Te Kanawa, Vladimir Ashkenazy, Charles Dutoit, James Galway, Sumi Jo, Midori, Bryn Terfel, Joshua Bell, Nigel Kennedy, John Williams, Dame Evelyn Glennie, Ben Folds, Tim Minchin, Jon Lord, Glen Campbell, Dionne Warwick, John Farnham, Gary Burton and Chick Corea. Master of Music, The University of Western Australia, 1992. Bachelor of Music, The University of Sydney, 1987. White, T., (2016), Sound Disintegration: new works at the 2016 Australian Percussion Gathering. Reverberations, Concert 7, Queensland Conservatorium Research Centre, Queensland Conservatorium Griffith University. White, T., (2016), Drums are the New Violins: New works and innovative techniques with Defying Gravity. Defying Gravity: Karma and Latin Carnivale, Fremantle Arts Centre and WAAPA, Edith Cowan University, Fremantle Arts Centre and Edith Cowan University. White, T., (2017), Defying Gravity: Steve Reich Under The Stars at Fremantle Arts Centre. Defying Gravity: Steve Reich Under The Stars, Fremantle Arts Centre, 'OffBEAT' percussion festival at Fremantle Arts Centre. White, T., (2017), Interrogating the Interface between Sound and Light: Eleven World Premiere Performances in Defying Gravity’s Kaboom!. Defying Gravity: 'Kaboom! ', WAAPA at Edith Cowan University, ECU. White, T., (2014), Multi-Percussion Innovation in Igor Stravinsky’s The Soldier’s Tale. Igor Stravinsky’s A Soldier’s Tale, WAAPA Music Auditorium, WAAPA and Fremantle Arts Centre. White, T., (2014), The Fire and the Rose: Baroque and Classical Timpani Performance. Canberra International Music Festival, Albert Hall, Canberra. White, T., Everall, P., (2014), Inventing a New World: New Music for Percussion and Clarinet. Classical Tuesdays: WAAPA Virtuosi I, WAAPA Music Auditorium, Tim White and Philip Everall. White, T., (2014), Three Faces of Contemporary Percussion : WAAPA Direct. WAAPA Direct, Fremantle Arts Centre, Perth, WAAPA and Fremantle Arts Centre. White, T., Wickham, D., (2014), Petrushka, Concerto in G and O Fortuna Re-imagined and Re-invented for Percussion. Petrushka and Classical Tuesdays, WAAPA Music Auditorium, Tim White, David Wickham and WAAPA. White, T., (2014), Defying Gravity: ‘Fiesta!’ : Establishing New Directions in Percussion. Fiesta!, WAAPA Music Auditorium, Tim White and WAAPA. White, T., (2014), Defying Gravity’s ‘Fascinating Rhythms’ : Creating New Performance Paradigms. Fascinating Rhythms, WAAPA Music Auditorium, Tim White and WAAPA. White, T., (2018), Percussion as Theatre: reconsidering the percussion ensemble via novel repertoire. 'Starstruck', 'King of Denmark', 'Cirque du Rhythm', 'Matsuri Defying Gravity' and 'Thunderstruck', Fremantle Arts Centre, Perth Concert Hall, ABC TV, WA Academy of Performing Arts, Edith Cowan University, Tim White. White, T., (2017), Hit Parade Festival of Innovation and New Music in Percussion. Hit Parade, WAAPA at Edith Cowan University, and Methodist Ladies College, Edith Cowan University. White, T., (2015), Defying Gravity’s ‘Stereo Action’ - Music Director. Defying Gravity : ‘Stereo Action’, WAAPA Music Auditorium, WAAPA and Tim White. White, T., Devenish, L., (2014), 2014 WA Day of Percussion: Synthesizing and Creating Knowledge in Contemporary Percussion. Western Australian Day of Percussion 2014, WAAPA Music Auditorium; Handa Percussion Studio, WAAPA and PAS. Master of Arts (Performing Arts), PRACTICING JAZZ PERFORMANCE: AN INVESTIGATION INTO THE PROCESS THAT UNDERPINS OPTIMAL INSTRUMENTAL PRACTICE IN THE JAZZ IDIOM.